Since its inception, the mechanical cow project has expanded over time in both breadth and depth and still ongoing. The first machine was installed at the Proximos Pasos Girls School in Santa Maria de Jesus which serves about 250 girls now – a growth from 125 girls in 2012. 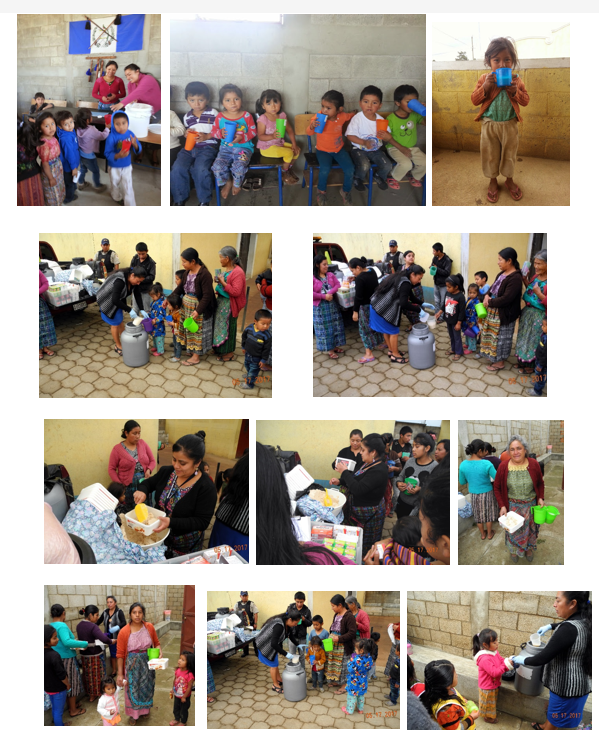 This was followed by installation and operation of two more machine at Sumpango municipality in February 2015 serving over 1000 children. 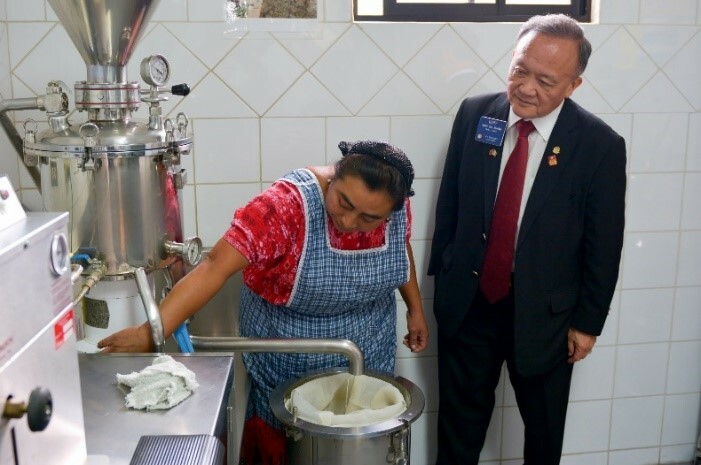 Finally, we have partnered with Guatemala Asuncion Rotary Club, District 4250 to install five more machines. These machines will be operated by five independent Cooperating Organizations at five different locations. In addition, each of these organizations will have direct oversight from a local Rotary Club close to their site as shown below. We expect these facilities to be fully operational in early 2018. Each of these organizations are investing a great deal of resources including space, manpower, funds, time and energy for overall management of the project and community outreach. The soy milk generated from eight machines collectively will serve over 4000 children in alleviating their malnutrition condition. The okara will help prepare protein rich food items for hundreds of families and microenterprise for tens of women. How does the mechanical cow work? The mechanical cow can be considered as a simple pressure cooker. Soaked soy beans are poured in the cooker from the top funnel. Water is added and steam generated separately in a steam generator is injected. These ingredients are cooked for about fifteen minutes while a motor at the bottom grinds the contents. A slurry like product is then taken out and processed through a press to separate the liquid soy milk from the solid okara. The soy milk is cooled and ready for consumption. It can be flavored to desired taste. Okara is used as an ingredient for many of the food products to enhance protein intake. The machine generates 17 liters of milk per batch. The machine can be operated continuously for an eight-hour shift having approximately eight batches per day. 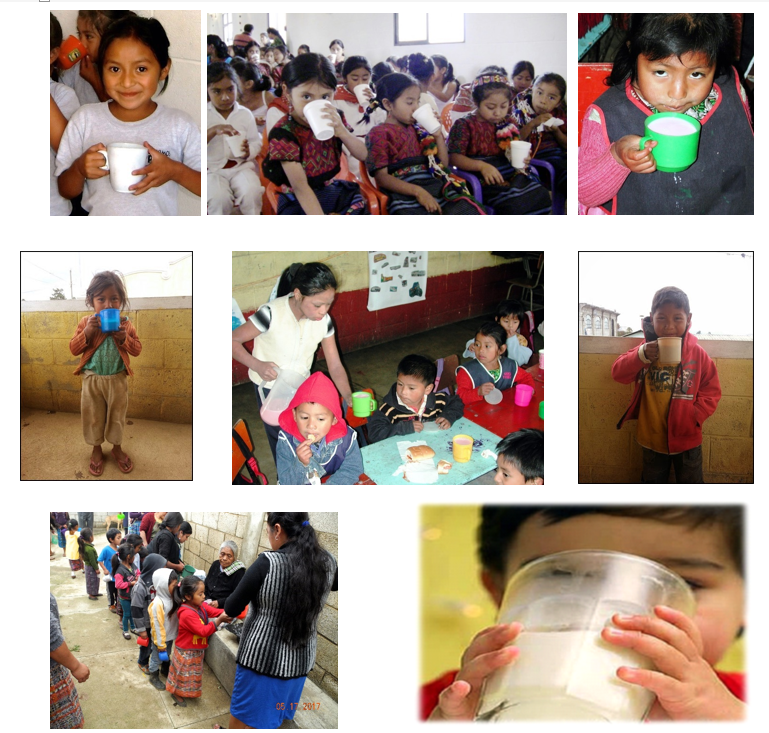 Soy milk is distributed to the children in the nine villages of Sumpango Municipality. Okara is distributed to women entrepreneurs engaged in microenterprise and to local women in these communities for their use to prepare food products. At the beginning, advantages of okara were not fully understood and as such it was not utilized and thrown away. Rotarian Mary Holcomb of the Barrington Breakfast Rotary Club advanced the successful idea of blending okara with many of the food items. The solid by-product “okara” is now used to fortify or blend the regular corn flour used by the families. The fortified flour is used to make tortilla for the daily use by the hundreds of families thereby increasing the protein intake for everyone. The other benefit of “okara” is to develop a micro-enterprise business where local women can make and sell protein rich okara based baked goods to generate income. 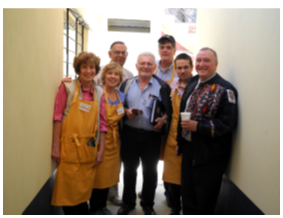 A Vocational Training Team of Rotarians from the Barrington Breakfast Rotary Club, Rotary District 6440 visited Sumpango for one week under the leadership of Suzanne Gibson with Mary Holcomb, Jeff Wieneke, Lincoln Schulte, Mark Gibson and Narayan Murarka participated. The team trained approximately eighty local women for the use of “Okara.” They received valuable information about the nutrition and benefits of soy milk and its byproduct. 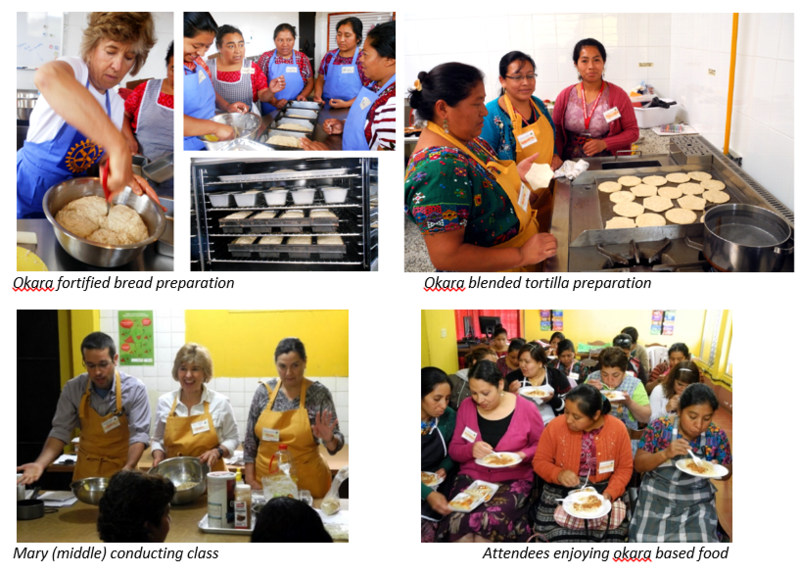 They learned how to blend okara in the flour and make many kinds of baked goods. They also learned the economic benefits of the microenterprise business. Based on our assessment, it appears that the Sumpango women understand the importance of nutrition and the benefits of soy milk and okara. Their children are recipients of the soy milk. They themselves make tortillas by blending flour with okara. Special mention needs to be made about five women who started their enterprise some two years ago. They have learned a lot about capitalism and making money. They are happy making and selling their products for a profit in an expanding market. Upon the installation of the additional five mechanical cows, dozens of more women will start their own microenterprise business. Role of the Rotary Foundation: The Rotary Foundation (TRF) grants officer, Maria Emig has been immensely helpful in guiding us through TRF guidelines and aligning our application accordingly. The Rotary Foundation also contributed approximately $175,000, over 60% of the budget, towards financing the project from the World Fund and District Designated Fund (DDF). Host Club Partnership: We are fortunate to have the partnership of Club Rotario Guatemala Sur, District 4250. Their members are dedicated, committed, hard-working and passionate. They get things done!! A dozen members committed themselves to these projects going to Sumpango on a weekly basis to oversee progress and plan future activities. Funding Partnerships: The Barrington Breakfast Rotary Club, District 6440 created “partnerships” among our Rotary friends within multiple districts and clubs – a hallmark of a Rotary’s Four Way Test: “Will it build goodwill and better friendships?” Major contributions came from District 6440 and District 7820 clubs along with DDF. Other contributing districts are: 4250, 6060, 6330, 6450, 6650, 6930 and 7040. We created a multi-country, multi-district and multi-club partnership. Alliances & Sustainability: Working together and developing alliances with organizations with common interests have been a major approach in our global grant projects. In each case, our partners committed to provide physical facility, hire staff to operate the machine, pay for utilities such as electricity, gas and water; and make provisions for distribution of soymilk to children. In addition, they agreed to promote and help women to start their microenterprise business. Sumpango municipality Mayor is one of our major partner. Dozens of women will be engaged in microenterprise to start their own businesses to make and sell okara fortified food products. Our project responded to the NEEDS identified through many meetings with community members and leaders over a long period. We built alliances among people with various stakes to come together and define, implement, and enjoy the benefits. This involved the Sumpango Municipality Government, school principals and teachers and various NGOs. The community people in various trades contributed sweat equity with their time and effort to build things required for the projects. Relationships that have developed over these years are significant. We have all developed a greater understanding and appreciation of each other. We are also building an international community. This aligns with Rotary's commitment to promoting understanding, goodwill and peace.